The capital of the Republic of Buryatia mixes Soviet and Buddhist styles in its architecture. The Republic of Buryatia, situated in the Russian Federation beyond the eastern shores of Lake Baikal, is home to a mixture of Russians and indigenous peoples who have rich cultures of their own. The capital of Buryatia, Ulan-Ude, is located some 100 kilometers southeast of Lake Baikal and has about 370,000 inhabitants. The city takes its name from the Uda River, a tributary of the Selenga, which is the primary river flowing into Baikal from the east. The appearance of Russian settlements in the area (known as Trans-Baikal or, more broadly, Dauriia) began in the middle of the 17th century, when Cossacks and other explorers sought new trading routes to China, as well as valuable furs such as sable. Within this vast territory, rivers were of vital importance as a means of transportation. Therefore, a small fort was established in the 1660s at the confluence of the Uda and Selenga Rivers. Originally called Udinskoe, the settlement became an administrative center of the Transbaikal region and a major point on the lucrative trade route from Irkutsk to the Mongolian border. The settlement's growing economic importance led to the building in the latter part of the 18th century of the Cathedral of the Hodegetria Icon of the Virgin, with façades decorated in a distinctive style called "Siberian baroque." The Hodegetria Cathedral is now the center of the flourishing Diocese of Ulan-Ude and Buryatia, created in 2009 by the Holy Synod of the Russian Orthodox Church. By the 1780s the town—renamed Verkhneudinsk ("Upper Udinsk")—had two annual trade fairs, in late winter and midsummer. Like other provincial centers during the reign of Catherine the Great, Verkhneudinsk was provided with an ordered city plan, approved in 1793. Although the plan was modified in 1839, many of its features remain to this day, as do important mercantile buildings such as the Merchants Court and the Trading Rows, both completed in the first half of the 19th century in a neoclassical style. In the 19th century, a few churches, as well as major administrative and commercial buildings, were built of brick, particularly along Bolshaya Street. But most of merchant Verkhneudinsk consisted of log houses, with or without plank siding and often decorated with carved window surrounds. Fortunately, a number of these sturdy houses remain in the central districts of the city. Other examples of the region's wooden architecture are displayed in the fascinating Trans-Baikal Ethnographic Museum on the outskirts of Ulan-Ude. The construction of the Trans-Siberian Railroad, which reached Verkhneudinsk in 1899, provided a major economic stimulus for local growth. In addition to its churches, the town also had a synagogue, reflective of a small but vibrant Jewish community. During the cataclysmic events of the Russian Civil War, Verkhneudinsk briefly served in 1920 as capital of the short-lived Far Eastern Republic. It became capital of the Buryat-Mongolian Autonomous Soviet Socialist Republic in 1923, and in 1934, the city was renamed Ulan-Ude ("Red Uda"). By 1939, its population had reached almost 126,000. The main examples of the city's Soviet architecture are grouped around the Square of Soviets, formed in the late 1920s at the head of Bolshaya Street, which had been renamed Lenin Street. These buildings range from the austere House of Soviets (1929-31), which served as the republic’s central administrative building, to the more ornate headquarters of the regional Communist Party (1939-41). The Square of the Soviets received its most unusual element in the fall of 1971, when a monument to Vladimir Lenin was unveiled. Among the thousands of Lenin monuments, this is one of the very few that can lay any claim to originality. The sculptors Yury and Georgy Neroda chose to create a gigantic head of the Soviet leader, mounted on a pedestal in front of the House of Soviets. The most significant monument of post-war Ulan-Ude is the Buryat Theater of Opera and Ballet, located near the Square of the Soviets. With its combination of Buryat motifs and Stalin-era decorative elements, the Theater of Opera and Ballet represents the florid style created in the national republics in the early 1950s. Above the main entrance is a statuary group composed of two rearing horses with a male and female rider symbolizing the Buryat people. The importance of Buddhism in its relation to local cultural traditions is impressively displayed in the city's excellent Museum of the History of Buryatia. 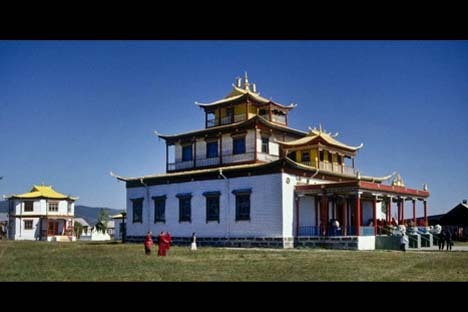 As the Tibetan form of Buddhism spread during the 18th century among the Buryats, there appeared early examples of the Buddhist monastery (datsan, from the Tibetan “court of meetings"). By the middle of the 19th century, 34 of these institutions existed among Buryat clans in the Tran-Baikal area. Today the most active Buddhist center in Buryatia is the Ivolginsk datsan, located some 20 kilometers to the south of Ulan-Ude near the Ivolga River. Founded in 1946, after the destruction or closure of Buddhist monastic communities in the 1920s and 1930s, the Ivolginskdatsan follows regional Buddhist principles in the structure and decoration of its temples, shrines, and libraries. The main temple (tsokchen dugan) was built of engineering brick in the late 1940s and has the traditional multi-leveled upper structure. The monastery’s other buildings are for the most part built of wood and painted in bright polychrome patterns. Within this sacred compound, Buddhist art and ritual merge with the dramatic landscape of Buryatia.